If we say no, he assumes we didn't understand him and keeps signing / saying "mo' ducky?" until we either put the ducks on or get up from the computer. Sometimes I shrink the windows so he can watch ducks on one half of the screen while I do my stuff on the other half :). The power went off in our neighborhood soon after I got home from work today, so we decided to go pick up something to eat - we couldn't cook and we knew being in the car would help LB go to sleep (he's been really cranky the last few days). Some of their conversations made me laugh, here's a couple of them. As you can see, BH's "inside voice" is more suited to a football stadium full of screaming fans. CB: I'm trying to solve this case [the case of the power outage, that is, he's into detective stuff]. I saw a firetruck, maybe a fire got really high and burned the wires and that's why the lights are out. dh: Did the firetruck have its lights on? dh: Then they probably weren't going to a fire. Maybe they were just going to get gas. CB: No, there was a fire... They need gas? BH: THEIR LIGHTS WEREN'T ON!! CB: Why do the wires need gas? dh: The wires don't need gas, I meant the fire truck needs gas because it's a truck. BH: Yeah [CB] there WASN'T A FIRE!! BH: NO THERE WASN'T! IT WAS JUST GOING TO GET GAS! CB: I'm solving the case, [BH]. BH: Hey, mama, dada. I ate all my food. BH: [CB], do you have any leftovers? CB: Yes, you can have my leftovers. BH: [searching]... There's no food in here! CB: I ate it all. CB: Oh, there's a fry. You can have that. 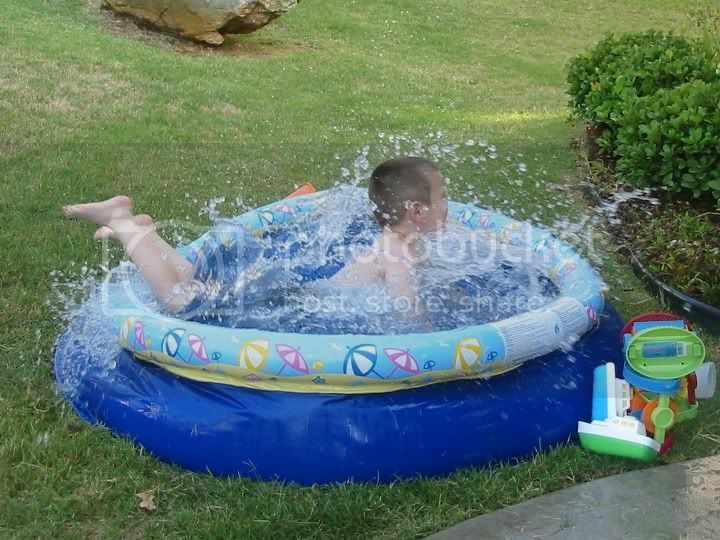 Here are some pics of the boys playing in their little pool in the yard. These were taken in the summer of 2006, Little Bitty was about 15 mos old and Cuddlebug & Bearhug had just turned 5 yrs old. Check out more Special Exposure Wednesday and Wordless Wednesday. One of the things about our twins that was simultaneously impressive and frustrating when they were younger, was that they were great with directions / navigation. Anywhere that they had been more than once, even if it was a 30 minute drive from home, they could remember how to get there again and they knew if we missed a turn. They are better than me with directions, that's for sure. The frustrating part was, they went ballistic if we missed a turn, or if we took a different route, or if we said you were going to Walmart but then had the nerve to stop for gas first (after all, we didn't say we were going to the gas station, we said we were going to Walmart). I'm talking screaming, thrashing, kicking, hysterical boys in the back seat. This was before they were dx'd so we really didn't understand why they got so upset over things like that. Once they were dx'd, we started to better understand their need for routine and the fact that they attached great significance to even the most mundane (to us) details (like which route to take to get to a particular place). For the sake of our sanity (what was left of it anyway), we knew we had to find a way to teach them that it was ok if we took a different route or made a stop along the way, we'd still arrive in the same place at the end. One thing we did was to draw out some crude maps of our area and show them visibly how you can start at a place and there can be two different roads that will get you where you want to go. We taught them the concept of "shortcuts" (it didn't really matter if the "shortcut" was actually shorter or not) and whenever we needed to make a pitstop or go a different way to get somewhere, we'd tell them we were taking a "shortcut." At first, they'd scream whenever we said we were taking a shortcut. But when we got to our destination, we'd point out, "see, we took the shortcut and we still made it here ok. There is more than one way to get to _________." It took time, but eventually, they caught on and accepted the idea, which made car trips much more pleasant! On the topic of his Thomas cards (which he calls "Tommy cards" or "Ton-nee coh"), Little Bitty has been playing with those all weekend. When we visited family in April, he learned a new game from his Grandma, which involves going through the deck of cards, naming the character on each card, and then tossing it on the floor while saying "oops!" (or "oot!" as he says it). LOL. This weekend I noticed him playing a new game, setting up 3 or 6 cards and then flipping them over saying "this one? this one? or this one?" ("dis-uh?"). I wondered what he was doing, until we were watching Noggin and there's Moose A. Moose doing a card-matching game on tv. LB watched intently and then ran over to his cards to pick up the game again. It seems Little Bitty can read some words, well sort of read them anyway. When CB and BH were learning the presidents, he saw the placemat they were studying from and said "James!" Sure enough, there are several presidents named James. And of course, he's familiar with that name from Thomas & Friends, lol. So I decided to do a little non-scientific test. He has a set of Thomas cards with the characters' names and pictures. I covered up the pictures so he could only see the words and asked him, "who's this?" He didn't get them all, but he was able to recognize several of them, including Thomas, James, and Gordon. Well, I think he is actually going off of the first letter, because when I showed him Henry he said Harold ("Hay-oh"). Still, that means he knows which names start with which letters. Pretty cool, just wanted to share :). 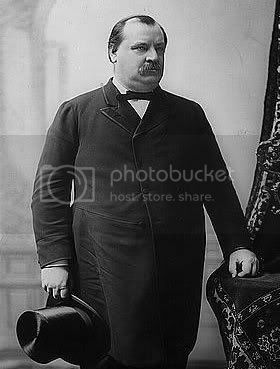 Oh, and when he was looking at the presidents, LB also pointed to Grover Cleveland and said "Hatt!" 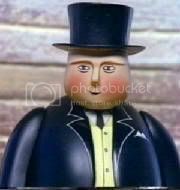 Apparently, he thinks he looks like Sir Topham Hatt from Thomas. What do you think? Here's my first participation in "Magic Marker Monday." This is a poem written by Cuddlebug this past spring (1st grade) about Poptarts, which as you can see, he likes :). I like them. Ask me why. Because they taste like dessert. Because there are lots of flavors. Because the taste is inside. Because you don't have to microwave it. That's why. I like Poptarts. Here's a drawing Bearhug did for school in Kindergarten (2006-07), it was about a day I had taken off work and taken them to the park :). "Me and Mom went to the park." I don't have a lot of artwork from him, he doesn't like to color much due to fine motor issues. He's working on it though! If you're a family member of someone who was recently diagnosed on the autism spectrum, this post is for you. I've been thinking about this, what would I have wanted to know, what have I learned that would be helpful to share? So here are some things I came up with that I think are important to know, and hopefully encouraging to hear, when you've just learned that your child has autism. 1 - Your child is the same child they were before the diagnosis. They haven't changed, the only thing that's changed is that you've been given an explanation, a way to understand why they do what they do, and why they struggle with the things they struggle with. Use that greater understanding to their benefit. 2 - You're not alone. It's a great comfort to know that there are others out there who know what your family is going through! Seek out others who are on the same path, you can support and learn from each other. 3 - You can do this! It's easy to get overwhelmed, but I'm a firm believer that our kids are ours for a reason. God entrusted their precious spirits to you because He knew that you would be the best parent in the world, for them. That doesn't necessarily make things any easier, but I've found that it helps to keep that perspective in mind. 4 - There are going to be rough days. 5 - There will also be amazing days! Life in general is full of ups and downs, life with a child on the spectrum is especially so. Celebrating your child's accomplishments is all the more of a blessing because of the extra work it often takes to get there (for them and you). I have learned a lot through trying to see the world through my sons' eyes. They notice and appreciate so many things that I wouldn't have without their help. Whether or not your child is verbal, they will most likely experience difficulty expressing their needs and wants to some degree. Your job as parent (or other family member) is to try to figure it out with whatever clues they can give you. If there aren't any clues, you'll have to resort to trial and error... Refer to #2 again, someone else who's been there may have some suggestions :). Ok, I know I keep referring to #2 but finding a support network is so important! It's very common for parents of kids on the spectrum to feel isolated. Many don't "get out much" because venturing out can take such a great amount of pre-planning and create a lot of stress. There are local groups that can help in person, or if you're like me and find most of your "social" time is in the middle of the night, there are online communities of parents / grandparents which can be very helpful. I'm always amazed to see that no matter how quirky or unusual a particular behavior or issue may seem, there are always at least a few other people who respond that they've been there too! As your kids make progress, they learn how to overcome certain things and it brings them to a new level of development where they find new challenges and then find ways to overcome those too. Please share your thoughts in the comments also! I've posted before about how it is very rare for Little Bitty to actually say "mama" -- just wanted to share that he said it tonight! It was getting close to bedtime, he walked over to me with a big grin on his face and said "mama" as he climbed into my lap to cuddle. Of course he doesn't stay still for long, he got up and said "da-dee" (also rare!) and crawled over to cuddle with dh for a minute. He did the back and forth a few times before finally settling down. Have a Thomas fan in your family? 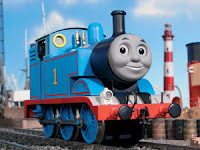 6 - you've enticed your child into the bathtub by telling him it's "time for a wash-down"
3 - you remember the frustration when they changed the Thomas tracks to a new kind that *wouldn't connect* to the old ones, aaahhh!! 2 - when frustrated, you've had to fight the urge to quote Sir Topham Hatt, "you've caused confusion and delay!" We have three huge Thomas fans at our house! I have to say, at this point I have a soft spot in my heart for Thomas and his fellow engines. They have been a part of our life for so long, and they have brought a lot of joy to our sons. One of the first inklings I had of my sons' talent for noticing and remembering details was when they started to name all the engines and could tell me each one's number and color... at age 2. Later, they could tell me other details like how many wheels they had and could draw "anatomically correct" pictures of them, complete with whistles, domes, buffers and funnels in the right places. Thomas has helped give us a way to communicate with our sons when that was one of the few things they wanted to hear about (I can remember having to tell them the Christmas story in the context of a Thomas story because that was the only way they'd listen to me...). Thomas was also helpful as BH and CB worked to develop their pretend play skills. They went from just rolling the trains back and forth, watching the wheels, to re-enacting the various Thomas stories (word for word!) to creating their own stories with the Thomas characters. They have a Thomas pillow and I used to "talk" to Thomas, pretending he was real. I was so excited when they finally stopped getting upset with me for pretending and started playing along. They would remind me every so often though, that "he's not really real, mama, he's pretend" just in case I might have forgotten :). Can you name all 43 presidents? Me either... but Cuddlebug and Bearhug can! They've been studying the presidents the last couple of weeks and thanks to their amazingly good memories, they know them all now and can even tell you who was which number. Can you tell I'm a proud mama? LOL. This has been great for their confidence, especially with the start of 2nd grade coming up soon. Afterward they both told me, "Mama, we're champions of this!" That's BH on the left (grey shirt) and CB on the right. New blogging site launching next week! 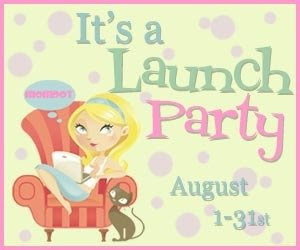 Check out momdot.com, originally set to launch Aug 1. but launch date now moved up to Monday, July 28. I have a few more things to say about this and then I will move on to other topics for now. Well, unless I actually get a response to my letter to Glenn Beck, in which case I'll share but I'm not holding my breath :). How those people perceive autism, and how they perceive people who have autism, has the potential to be influenced by some ridiculous shock jock who's out for ratings. So many people already have the kind of misperceptions he spouted off on his show, and for those he just reinforced and justified their animosity towards those with autism. Some may not know anything about autism, and after listening to him, now have their opinions influenced by dangerous misinformation. In my opinion, it's vitally important to respond and to try to educate those who will listen rather than to ignore it. Savage and many of his supporters claim that those who are calling for him to be fired are attempting to stifle his free speech. Absolutely not! His right of free speech allows him to say whatever he wants. However, free speech does not require that he be given a national pulpit from which to say it. Free speech does not protect him from having to take responsibility for his words and face the natural consequences (eg. being protested, losing sponsors, being fired). He has no constitutional guarantee of airtime and sponsors. Those of us who find his comments offensive have an EQUAL right of free speech to voice our outrage over his comments. We have every right to contact his employer and his sponsors to express our concerns, and they have every right to act on those concerns if they so choose. Companies spend millions of dollars on advertising, and they have every right to choose where those dollars should be spent, and who they decide to support with their advertising budget. It's called a free market :). If you'd like to write to the sponsors of Michael Savage's show, there is a list here, along with updates on some of the responses that have been received from various sponsors. So far, Aflac has pulled their advertising from the show, and Directbuy.com has opted not to renew their advertising contract which expires this week. Kudos to them for taking a stand! Ok, I've debated whether to post anything about this or let it go and ignore it. As you can see I've opted not to ignore it. You've probably heard about the despicable comments made by Michael Savage, a radio talk show host, about children with autism and their parents last week. I guess it's pretty easy to attack a bunch of children and families in the pursuit of ratings. Obviously he didn't listen to his own father's advice of "don't be an idiot." Then again, I guess if he's on to something then I wish we'd known sooner that all we had to do was verbally abuse our kids and the autism would go away just like that. Guess we should call the school and tell them to cancel the IEP's, all they really need is to have insults screamed at them. Yep, that'll fix everything. I can't even say the things I would like to call this guy >:(. I have never listened to his show, didn't even know he existed until this actually, but from what I've read he has a lot of listeners and the notion that some of them will believe what he is spewing is just sickening. I was wondering where the media frenzy was. After all when Don Imus made disparaging comments about a women's basketball team, it was all over the news and he was promptly fired. Finally yesterday, dh told me that Glenn Beck would be hosting Larry King live and interviewing Savage. Here's the video clip of the interview, it also includes a playback of the original comments that Savage made on his own show. First, I want to say that I am a regular listener / viewer of your shows (and I enjoyed your book!) and I have a lot of respect for you. That being said, I was very disappointed with your interview of Michael Savage on Larry King last night. As a mother of three little boys with autism (7-yr-old twins and a 3-yr-old), I found his remarks extremely offensive and hurtful, and when I heard you'd be interviewing him I was looking forward to you challenging his comments on behalf of the innocent children he berated on his show. Instead, you basically handed him the "taken out of context" excuse and then allowed him to continue on making ignorant comments about autism. I'm sorry, but there is NO context in which his statements would be acceptable. The idea of treating any child the way he advises, much less treating a child with a disability that way, is deplorable. This morning on the radio, you said he had a point about overdiagnosis and then launched into about 15 minutes on ADD / ADHD and medication, with no further mention of autism (at least not before I had to turn off the radio at work). I understand your personal connection with ADD, but my main concern with your interview last night and subsequent discussion this morning is that by not refuting him, and by giving credence to any part of his argument, it gives the appearance that you are validating what he said. We have a long way to go in terms of developing awareness and acceptance of those with autism, and things like this just add to the public misperceptions. If you're still reading this, I'd like to share some facts about autism with you and refute much of what Savage said. Autism is a neurological condition, not an illness. My kids aren't sick, their brains are just wired differently. Unlike ADD/ADHD, there is no medication for autism, so I'm confused at what "big pharma" has to gain from kids being diagnosed with autism. Although there is no blood test for autism, there is a clearly defined diagnostic criteria in the DSM-IV, and it involves much more than just "late talking." There is a "triad of impairments" in the areas of verbal / nonverbal communication, social interaction, and imaginative / creative play that must be present for a diagnosis of autism. Getting a diagnosis can take a long time and involves a number of evaluations by different specialists. It's not as though you can walk into your pediatricians office and walk out with a diagnosis of autism. Further, while there are some people who have both autism and mental retardation, many autistic individuals are highly intelligent and it was frustrating to see the myth that one can't be both "bright" and "autistic" perpetuated on the show last night. In fact, I suspect that those with autism are even more intelligent than the rest of us may realize, because intelligence is often measured by communication skills, an area where those with autism struggle. You may be interested in the story of Amanda Baggs, she is someone who to an observer might appear to lack intelligence but that is far from the truth, as evidenced by her writing. We love our kids just the way they are, they are gifts from God and we're blessed to be their parents. We're doing what we can to help them learn to cope with sensory overload, improve their communication skills, etc. Our twins have come a long way so far, and our youngest has made progress as well. They aren't brats, they certainly aren't fatherless (my husband is a full-time SAHD), and they aren't lacking discipline. Screaming insults at them isn't going to cure their autism. What they need is compassion, understanding, and a little patience from those around them. What's really ironic is that my kids are some of the most kind and loving people you'll ever meet. One of the strengths of autism is that they don't care about superficial things, they see people for who they are inside. Michael Savage could learn a lot from them. 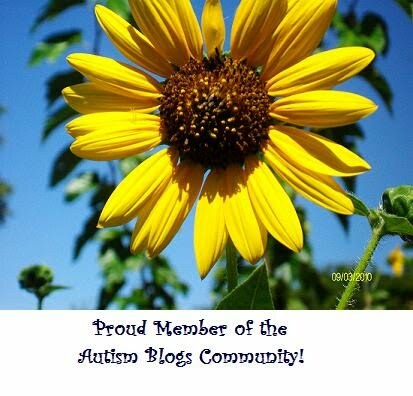 I know you're extremely busy, but since it's been a recent topic on your show, I hope that you'll take a few minutes to learn more about autism - there is a good summary here. I took this picture of the boys yesterday, I love it! 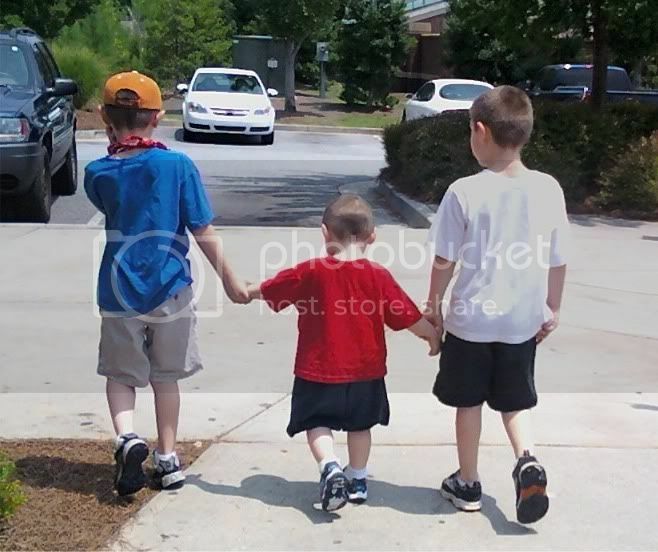 It's so hard to get pictures of all three of them together, and I managed to snap this as they were walking, with each of my twins holding their little brother's hand. See more Special Exposure Wednesday and Wordless Wednesday. “Family-friendly” is a start, but it’s probably not enough. This one will take some trial and error, but it makes a huge difference to the success of the outing. If you’re trying something new, a little reconnaissance might be in order, even if it just checking out pictures and menus online to see if it is likely to be overstimulating and if they have menu choices that your little ones will like. Once you find a restaurant your kids are comfortable with, keep going back. This has two benefits – first, overstimulation is less likely when the environment is familiar, and second, the staff will get to know you. If they know you’re a regular customer they may be more willing to be kind / patient toward your family. We always plan to go between meal times, when the restaurant is least likely to be busy. It’s a good idea to be prepared with a “plan B” destination in case you get there and find a parking lot full of cars and a line waiting outside. You might have to get creative with the activities. Due to fine motor issues, our boys didn’t like to color so the crayons and coloring pages that many restaurants offer didn’t help us much. They also had about a 10-second attention span so toys didn’t work for long. One thing that worked really well was flash cards. We brought huge stacks of flash cards to do while we waited, and our twins loved to look at them and tell us what they were (they had trouble communicating but they were great with object identification and it was fun for them). Now that they are older, Nintendo DS works great :). We’re still trying to figure out what will work best for our little guy. No, seriously. By the time your children have waited for a table, waited for someone to take their order, and waited for the food to arrive, they may not be up for waiting while mom and dad eat. This is the double-edged sword of bringing them snacks to occupy them while they wait. We’ve found that this has gotten better with time though. We always try to clean up a bit before we leave, because our table (and the floor underneath) usually looks like the Tasmanian devil came through more than once. But even with our efforts, the state of our table usually still warrants a good tip (assuming the service was also good). We hope that it also garners goodwill on the part of the staff, so that if our kids happen to have a rough day the next time we come, they’ll be nice about it. If you can see your child is getting overstimulated, or there’s an impending meltdown on the horizon, or if your child is already upset, take them outside for a break. You might be able to get away with just taking them to the foyer, but we usually have to go all the way outside and sometimes a stroll around the building. Once they’re away from the crowd and the noise of the restaurant, our kids usually can calm down fairly quick (and if not, at least we’re not disrupting everyone in the restaurant). Once they’re ready, you can try again. Try to relax and help your kids enjoy the experience. If it’s fun for them, they’re more likely to be pleasant and calm. If things go awry, be prepared to jump ship and try again another day. There have been times we’ve had to ask the waiter/waitress to box up our food before it even made it to the table. If there are at least two adults, have one take the kids to the car while the other pays and waits for the food. #10 – Don’t give up!! Teaching our children to interact "appropriately" is a PROCESS, one that can take a long time. It doesn't happen overnight. At age 2, our kids were a disaster waiting to happen in restaurant. By age 6, we could take them out, even to a new place if it wasn't crowded and they weren't already overstimulated, without incident. Had we kept our boys home all these years, we'd still be unable to take them to a restaurant. You have to start somewhere. We now find ourselves back to "square one" in a sense, because our 3-yr-old, who is also on the spectrum, faces the same difficulties as his brothers, and he's at the beginning of that learning process. Sometimes we choose to save that battle for another day, and just stay home or eat take-out in the car :). It's official, my 3-yr-old is a cran addict. Let me back up a little bit. This past week has been rough with him having meltdowns almost every evening (not counting extra crankiness during the day). Probably it is because his big brothers were at camp during the day this week so his routine was impacted. After all, even though they enjoyed camp, the routine change had CB and BH out of sorts for the first couple of days too. So, here we are, at the end of a long week and here we go again. The crying, screaming, rolling, and yelling "no, no, no!" (now that he's re-learned that word, he's all about using it at any opportunity), and the most frustrating part, where he tells me wants something and when I try to get it for him he decides that's not what he wanted and goes ballistic. That's always fun. One of the things we've worked really hard with him on is to be able to say "I want _____." He doesn't actually say the "I want" part except very rarely, but if we say it to prompt him, and if it's something he knows how to say, he'll usually fill in the blank for us. It's especially helpful when he's upset, because sometimes he'll calm down when we prompt him and try to tell us what he wants instead of screaming. The catch is that sometimes he can't have what he wants, which just makes the crying and screaming all the worse because not only is he upset but now he's frustrated because for all he knows, we just didn't understand what he said and if he could only say it again... and again... and again... and maybe punctuate it with some head-butting and dragging us to the fridge (check again! ), then maybe we'd understand him. At least that is what his logic appears to be. Which brings me to the part about cran. 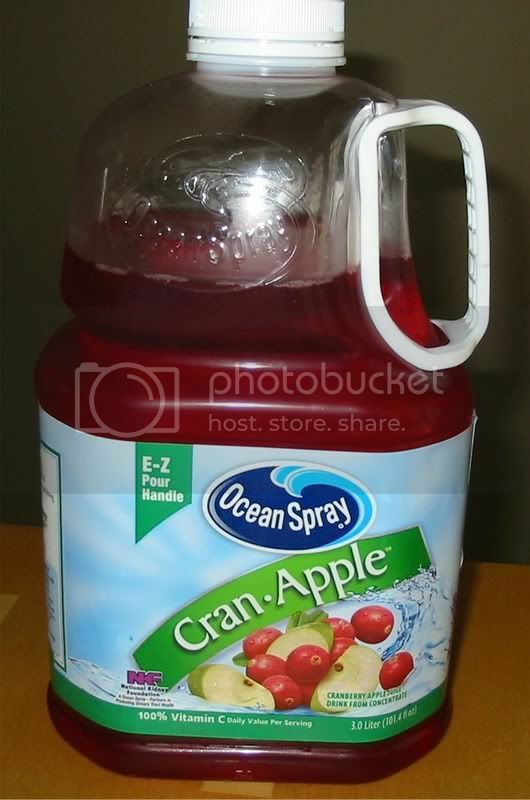 Cranberry-apple juice (which he calls "cran") is his absolute favorite juice of all time. He loves it. He will drink other juices, and occassionally if he gets "cranned-out" he'll even prefer another juice for a short period of time. But he always comes back to ol' reliable, cran. (So if you hear me referring to him as "the cran man" that's why). Well, guess what he wanted today? And guess what we are out of? ugh. We were going to stop at the store to pick some up today but we had a couple of other stops to make and unfortunately we reached our "quota of allowable stops" (which changes based on how the boys happen to be doing on any given day) before we made it to Wal-mart. So when he asked me for cran, I had to tell him "cran's all gone." Wrong answer. I tried to find the "backup cran," a powdered version that mixes with water for cran-on-the-go, but couldn't find any. Later, when dh came back in from doing yardwork, he found it and made a cup for LB. At first he pushed it away, but changed his mind when he realized what it was. After nearly two hours of meltdown, he finally relaxed and drank his cran until he fell asleep in my arms. Sigh. The battle over wearing shoes is over! He said LB's eyes got wide with excitement and he started saying "Tommy shoes! Tommy shoes!" when he saw them. Thankfully, they had a pair in his size (otherwise, can you say MELTDOWN waiting to happen??). And not only do they have Thomas on them, they also light up -- just doesn't get any better than that! LB is not typically a big fan of wearing shoes, but now that we have Thomas shoes, I think this will be grounds for a truce in his little war against shoes. Little-Bitty said a new phrase yesterday! After an extensive meltdown in the car, he finally calmed down enough to say "go home," which he then combined with a phrase he already knows, "time to go!" and said "time to go home!" Luckily, we were already on our way home. We were impressed, partly because he was able to combine two phrases to make a new one that he hasn't said before, but more importantly because once he calmed down he was able to tell us what he wanted and explain why he'd had the meltdown in the first place. I still remember the first time CB gave us an explanation after one of his meltdowns, I'll have to write a separate post about that. 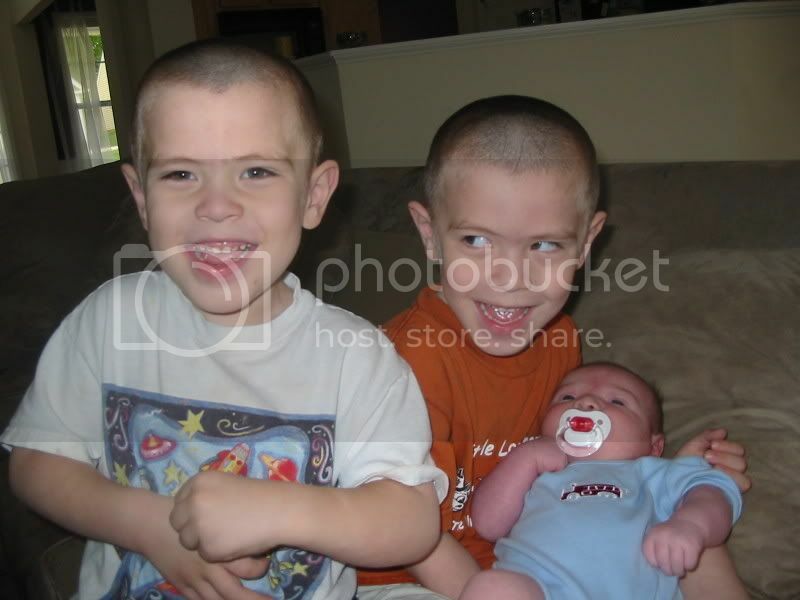 When we brought LB home from the hospital, his brothers were so excited to meet him for the first time! We did not try to have them come to the hospital to meet him. Two overstimulated and hyperactive 3-yr-old boys + expensive hospital equipment and stressed out nurses = disaster waiting to happen! Of course the first thing CB wanted to know was how he got out of my tummy, and could he see the "door" in my tummy? (umm, no) BH brought me an armful of toys for LB to play with, he didn't realize at first that newborns can't really play with toys but it was a sweet gesture. CB absolutely adored his baby brother. He told everyone that would listen, "He's a little bitty! He's a little bitty baby! He's a little bitty baby precious!" Before long, he was calling him Little Bitty every time he talked to him, and the name kind of stuck. I guess it could have been worse... CB also loved to shower his baby brother with kisses, and for some reason he especially loved to kiss his chubby little legs, or as he put it, "I love his juicy legs!" LOL If I had pants on him, he'd push the pants legs up so he could kiss his legs, and a couple of times I thought LB's diaper had leaked only to realize that his legs were wet from slobber kisses. Very sweet! BH has always been a little heavier than CB, ever since birth. This was initially due to TTTS, and as they have grown it's just stayed that way, with the initial 1.5 lbs. difference growing to appx. 6 lbs. difference today. For the boys, this was a big deal. They weighed themselves all the time (well, that started when dh and I went on a health kick) and got excited every time their "number" went up, but CB was continually disappointed when his number (weight) didn't catch up with his brother's. It seemed to be beginning to affect his self-esteem. I even heard him refer to BH as the "big brother" a couple of times. I told him repeatedly, since they are twins, BH is not his "big brother" b/c they are the same age. He insisted that he was the "big brother" because he was bigger. Nevermind the fact that they are the same height (within 1/4"). So one day I wondered out loud, to myself really but so they could hear me, "I'm tired of hearing about the weight thing, maybe I should tell them who was born first." You know, just to even things out :). Obviously the question of who was born first is just as irrelevant as who weighs more, but since they'd attached so much significance to the weight issue it seemed only fair to bring it up. I left it at that. Well, sure enough a week or so later, CB asked me who was born first. I told him he was, by just 2 minutes. He asked me why and I told him because he was closest to "the door" (funny story, that's another post). And wouldn't you know, it seems that this little tidbit of knowledge has levelled the playing field, now they each have something "special" and you know, I haven't seen any boys checking their weight or making a big deal about their "numbers" in a while now. The self-esteem issues I was beginning to see with CB have faded away, with no detrimental effect on BH's oodles of confidence. According to our sons, however (at least the two who are old enough to express an opinion on the matter), dh is the "big boss." Hmm... I was more than a little surprised when BH told me that and CB readily agreed. "What makes him the big boss?" I asked. "He's taller than you," came the logical reply. Ok, makes sense, in a weird sort of way? BH then told me, "well, you're the big boss whenever Dada is sick." Well, that's good to know I suppose. I should have asked them, if we're both sick does that make them the "big bosses"? Haha, I don't think so ;). On second thought, I'm glad I didn't ask them that, no sense giving them ideas, lol. He's still my little "mama's boy"
I wrote this back in October 2007 about my Little Bitty and how he'd changed, first regressing and then starting to make some progress with help from Early Intervention. Thought I'd share it here. A little over a year ago, when LB saw me he would run up to me saying "mama! mama!" and holding his arms up for me to pick him up. A few months later, he rarely said "mama" anymore, but he'd still run up to me with his little arms up to be held. A little more time passed, and he stopped saying "mama" altogether. When he saw me, he might come over and give me a hug, or want to be held, or he might ignore me and go about his business. His communication and interaction regressed some more... and I realized that when I came home he no longer even looked up or acknowledged me. He might notice a while later that I was there and come over to be held, but it wasn't quite the same. It was heartbreaking. Now that LB is in therapy and making progress, I've noticed a reversal of this trend. When he sees me now, he usually comes over to give me a hug or be held. Every now and then, he will say "mama" again, and my heart skips a beat when he does. One of the things we've been working with Little Bitty on for a long time is "yes" and "no." He's never really done the head shaking or nodding thing but he does express himself so we've pretty much figured out his signals but wanted to teach him how to use the words yes and no. His speech therapist gave us some PECS cards to use for this too. Several months ago, he could say no ("nuh") but he would say no for everything, whether his answer was actually yes or no. For example, we'd ask if he wanted some crackers, and he'd say "nuh!" So we'd put the crackers away because he said no, only to have him start jumping up and down, squealing and reaching for the crackers while opening and closing his hands (which means "I want that"). So what he really meant was, yes. After much effort, he learned to say the word yes ("yets"). Only then, he stopped saying "no" and started saying yes for everything, whether the answer was yes or no. Using the same cracker example, I'd show him the box and ask if he wanted some, and he'd get a disgusted look on his face, shove them away with his hand and give me a resounding "yets!" LOL. Of course I'd tell him, "don't say 'yes' when you really mean 'no'" but he didn't care. He knew I could tell what he really meant. Just this last week, we've started to hear him saying "no" again, and not only that but he's using it appropriately. It's been so cute to hear him, if I pick out the "wrong" pull-up he'll run to the cabinet saying "no, no, no!" and pull out the one he wants. Or when I wanted to play Guitar Hero and he yelled "no!" and pushed the guitar away. I haven't heard him say "yes" lately so I don't know if that one's gone into hiding now. But he does give me a huge grin when I finally stumble on what he wanted, so he gets his point across :). The book, "The Out-of-Sync Child" by Carol Kranowitz, was recommended to me when our twins were dx'd with autism and sensory intergration disorder. At the time, I was just starting to learn about autism and didn't really know much at all about sensory processing issues. The first section talks about how to recognize sensory integration disorder and gives a number of examples of what to look for. The second section goes into how to cope, and how to help your child cope and learn to overcome sensory issues to the extent possible. This book was extremely helpful to me, I saw a lot of my boys in the examples given. The author describes both sensory-seeking and sensory-avoiding behavior. Typically when you hear about sensory issues, you hear about the sensory-avoiding aspects -- children who can't tolerate certain textures or hate loud noises. What we don't tend to hear as much about is the sensory-seeking aspects -- children who crave sensory input so they run around crashing into people and furniture, or who flip themselves upside down at every opportunity. Each of our sons has both sensory-seeking and sensory-avoiding tendencies, although they lean more toward sensory-seeking for the most part. What I found most helpful about this book is that it helped me to gain a better perspective on how our boys experience the world around them. Most of us take sensory integration for granted, we don't even realize how our senses are working together to help us maintain balance, plan movements, and interpret tactile input. I gained a lot of insight into trying to see the world through their eyes. 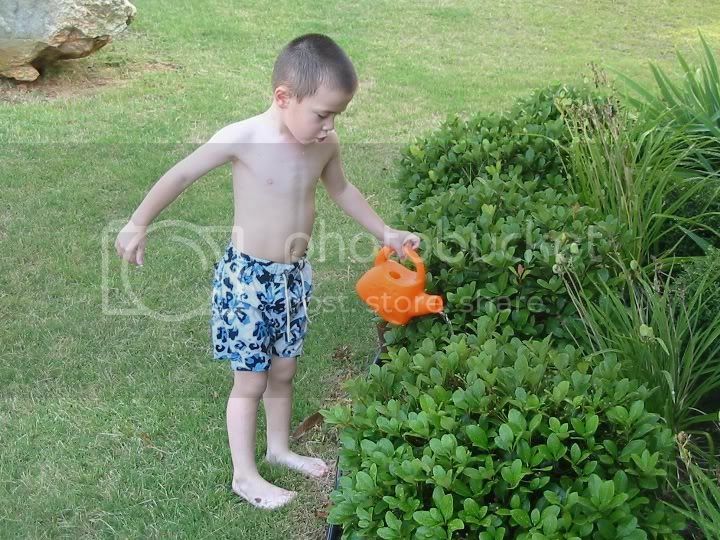 It also helped us start learning to "think outside the box" in terms of what was causing some of our sons' behaviors. It gave us some new ideas of possibilities to consider when they had meltdowns, and once we knew what to watch out for, it slowly became easier to start trying to avert the meltdowns before they happened. Definitely worth reading if your child or someone you know has sensory integration disorder, or if you'd just like to learn more about it. 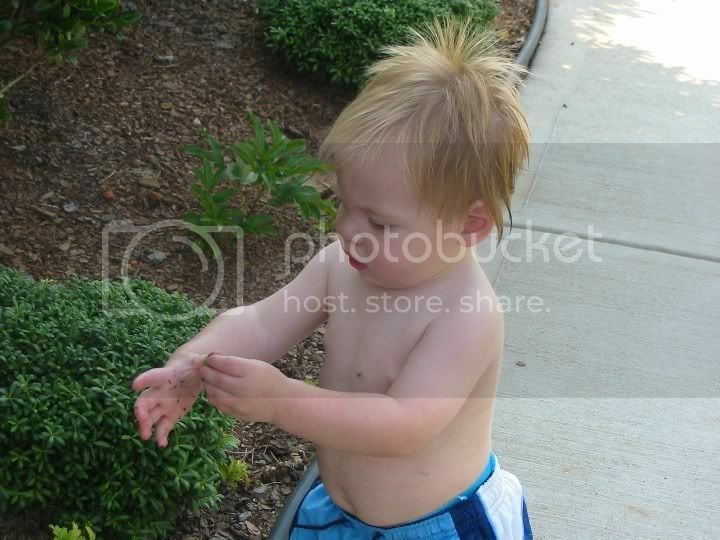 Wow, when I went to find a picture of Little Bitty with his paci, I also found this one, taken the same day. I miss his long sticky-uppy hair!! Please vote! Should I change the name of this blog? When I first started this blog I named it the first thing that came into my head. I'm trying to decide if I should leave it as is or change it to something else and would welcome any input. I've added a poll at the top right corner, looking for feedback on whether I should keep the name as it is "Everyday Adventures & Random Thoughts" or change it. If you have a suggestion that isn't on the list please choose Other and add a comment to this post with your idea. This post will probably "self-destruct" (or just be deleted by me) at some point, just wanted to give anyone who's been reading so far a heads up. A couple of weeks ago, Little Bitty picked up the word "beautiful" when I used it to describe his artwork. He's not much on coloring (well, on paper anyway, he likes walls just fine) so I was impressed to see him at work with some crayons. Of course, I ooh'd and aah'd over his drawing and told him "I love it, it's beautiful!" He smiled really big and said "dee-fooh" (his version of "beautiful") for the first time. It was so sweet! This morning he climbed on my lap, touched my face (gently for once, lol) and said "dee-fooh." I don't know if he meant it to say "you're beautiful," "I love you," or just "I'm glad you're here" but either way it was obviously said with love and he was just precious! Of course I told him he's beautiful and gave him a kiss, which made him smile. I'd love to hear from others, tell me about the precious, simple moments you've shared with your family. Took this picture over the holiday weekend, I love their smiles! Cuddlebug "made up" a number today. He's pretty intrigued by the idea that you can make something up, and have it become "real." For example, you can make up a song and have it become a real song, or you can make up a word, and it becomes a real word. So, he wanted to make up a number. He asked me how we let people know so they can start using this number too. I told him I wasn't sure how to do that, but hey, I figure posting it here is as good a way as any, so here goes. The new number is called a "pillion" and it is the number that comes after "a zillion and 99." Tonight Cuddlebug (who is eager for Little Bitty to start talking more) offered to teach LB lots of words, "because I know lots of words." And that he does! Lesson #1 came when LB was playing in the sink (which he knows he shouldn't be). CB said, ever so politely, "Excuse me 'LB.'" Bitty ignored him of course. CB kept trying, bless his heart. "Excuse me... that means I want you to move... you're in the way... excuse me..."
"There's two kinds of excuse me, one is for when you want someone to move out of the way, and the other is for when you burp." Echolalia, for those that don't know, is basically repeating back what you hear, and is a common speech issue for those on the spectrum. It can take the form of repeating back just the last word you said, a whole phrase, either right away or at a later time, or even entire scripts / dialogues from conversations, tv, movies, or other sources. Us: "Your name is 'CB'"
Us: "Yes! That's it! Ok, what's your name?" Me: "Do you want milk or juice?" Silly me, I thought he was answering my question, so imagine my surprise when I brought him juice and he responded by screaming and throwing himself on the floor in a meltdown. Apparently, he didn't want juice! Fast forward a bit, we were getting real responses (woo-hoo!) to questions and yes, they learned to answer not only what their names were, but how old they were (although if you asked CB "how are you?" he'd also answer that with his age). Then we started to hear the "whole dialogue" form of echolalia in their play. They played with their Thomas trains a LOT and when I stopped to listen I noticed something familiar about the words... only to realize they were quoting word for word from actual Thomas stories. Now at age 7, there is almost no echolalia in their speech. Although every now and then Bearhug will quote me an entire commercial if it's something he's interested in, like Mighty Putty. Any time something breaks he goes into "commercial mode" and tells me word for word all the great things about Mighty Putty and how it can solve all our problems (did you know it can pull a truck? Apparently so!). By the time he's done I'm convinced the stuff will actually end hunger and promote world peace. Ok, slight exaggeration ;). This brings me to Little Bitty. His speech is more delayed than his brothers at the same age. For the longest time, he wouldn't repeat back anything. He just completely ignored us most of the time. So when he started repeating back words we were thrilled! It's just one step on the road to developing interactive communication skills. He has a number of little phrases too, and he knows what they mean b/c he uses them appropriately. For example, anytime he finds himself somewhere he doesn't want to be, he says "time to go!" lol. The words he does say, he has to work really hard to get them to sound like the word he's trying to say. Some of his words have been very different from the actual pronunciation, so it takes a little detective work to figure it out, and it's still a work in progress. For example, I remember a while back he was looking at the moon outside, and since he seemed so interested in it, I pointed and said "moon... that's the moon" He concentrated for a minute and then said "tuh." Now he can actually say "moon" well actually it's more like "moo" but it's much closer to the actual word than "tuh." One thing that impresses me is that he seems very aware of the fact that people have a hard time understanding him. He'll say something and then look at me expectantly, waiting for me to repeat it back to him indicating that I understood him. If I don't, or if I get it wrong, he'll keep saying it. It occurred to me the other day that from his perspective, I am the one with echolalia because I'm always repeating back what he says :). That's ok, because he's definitely making progress and it is so cool to see each of his little steps along the way. It occurred to me that in my posts I have been mostly focused on the present so far, but I think that in order to really tell our story I need to also share some of where we have been on the journey so far. So, you'll start to some posts here and there that go into more detail about how we got to this point, hopefully you'll find them interesting. It's not about dwelling on the past but I think particularly with Bearhug and Cuddlebug it's hard to convey how far they've come without telling you more about where they started out. Suggestions are welcome, as always! Video of the day: More Cowbell! A little break for a funny post, I think Christopher Walken is hilarious, and this skit from SNL cracks me up every time. And today, I was the wimpiest of them all. I actually took a nap, and not just any nap, I slept for several hours. I think the allergy medicine I took had something to do with that, but it was kind of nice :). Until Little Bitty started running circles on the bed and finally resorted to pulling my hair to wake me up. That's his new thing, pulling my hair. I'm not a fan, as you can imagine. Since LB got sick with a double ear infection a week and a half ago, his sleep schedule has been very disrupted. He's always had sleep issues, but he'd finally gotten to a point where he was in a good routine, going to bed fairly well as long as we stuck to a consistent bedtime routine, sleeping through the whole night, and waking up in a decent mood. Gone were the horrible bedtime meltdowns, the 3am escapades, and wondering every morning whether it would be Dr. Jekyll or Mr. Hyde that woke up that morning. Until he got sick, and then all bets were off. He's feeling better now, but it's been a struggle to re-establish his bedtime routine. Yesterday we went into an all-out screaming meltdown when it was bedtime, I finally gave up and brought him downstairs so his brothers could get some rest, only to have him climb into my lap on the couch and fall asleep. Which I don't mind, but could we skip the hour-long hysterics that preceded it? Was it really necessary to kick and try to punch me? Was it really necessary to tear off his pull-up and scream at the top of his lungs (without stopping!) in protest of the unfairness of bedtime? Was it really necessary to try to take the lid off his sippy cup in the hopes that he could spill it because nothing says "I'm angry at the world" like dumping your sippy cup all over the floor? And of course when he couldn't get the lid off, that just made him all the more angry so he settled for throwing it across the room. Sigh. I feel so bad for his brothers when he does this, I know it bothers them although they are nice about it. Not that they are strangers to this kind of behavior, they were famous for it and then some when they were his age. But still. Tonight he did better, hopefully he's getting back to a somewhat normal sleep cycle again. Now we just keep our fingers crossed that he sleeps all night and wakes up happy (or at least indifferent). Little Bitty is a man of few words, but he continues to add new ones here and there. Here's one of his new words - honeybun, aka "huck-a-doh." I love the way he says it :). Lego creation & words from Little Bitty! Cuddlebug and Bearhug like to call the things they make "creations." A creation can be anything -- a drawing, lego construction, geotrax track design, a fort, etc. Today I found a pretty cool lego creation in their playroom -- it's an elevated train track complete with buffers and a dock loader. Little Bitty was pretty excited when he saw it (what train-lovin' little boy wouldn't be?) so he decided to put it to good use. I have to say I was impressed that the construction was sturdy enough to withstand repeated use by Mr. Destructo. Since I already had my camera out I shot a few video clips of LB playing, and caught some of his words too. Nothing like some Thomas trains to get him talking :), he likes to say their names. I love to hear his voice! And his laugh is beautiful. He's making progress on his words, for example, he used to pronounce "Percy" as something that sounded like "pooh-foo" but now it actually sounds more like "Percy." This is the question Cuddlebug greeted me with yesterday morning. He has a stuffy nose, so it's no wonder he's curious about the purpose of boogers. I decided this was a good teaching moment and said, "let's look it up!" And so we did. Google is great, when I as a kid I would have to actually make a trek to the library if I wanted to do a little research on boogers. Now, anyone who is so inclined can do so in a matter of seconds from the comfort of their own home. Apparently, CB and I are not the first people to ask this question. Google came back with over 1.5 million hits in response to my search for 'What are boogers for?' In case you're curious, boogers (aka mucus) are one of the body's self-defense mechanisms. We talked about that and I told him that sometimes our bodies make too many boogers and that's how we end up with stuffy / runny noses. I asked him if he needed a tissue to blow his nose, and he said he already did, actually what he said was, "I used the kleenex to pull out my boogers, mama, and then I did a dot-to-dot with them." Leave it to my son to come up with the idea to do a dot-to-dot with his boogers. Sigh. 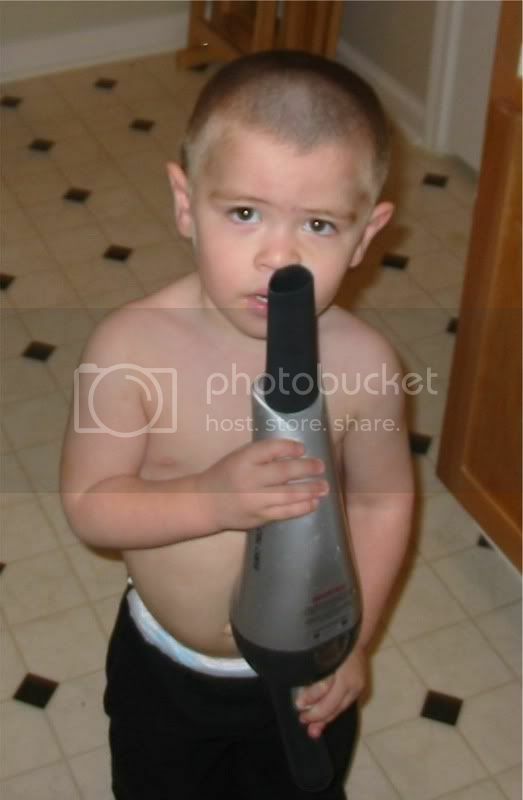 As long as we're on the subject of boogers (because it's not a topic I'm hoping to return to anytime soon), here's a trip down memory lane, and one boy's solution to the problem of too many boogers. Bearhug and Cuddlebug like to make lists. They make all kinds of lists, lists of what they like to eat, lists of their friends, lists of things they'd like for Christmas, lists of numbers, lists of things they've cleaned or chores they've done, lists of what they'd like to do today, you name it. So it was no surprise when BH decided to make a checklist for what he planned to do yesterday. We don't always follow their "to do" lists but as it turns out, this pretty much sums up how our day went, although not quite in that order :). Dh went a little nuts buying fireworks, and we had a joint firework display with some of our neighbors. It was the first time we've done that. 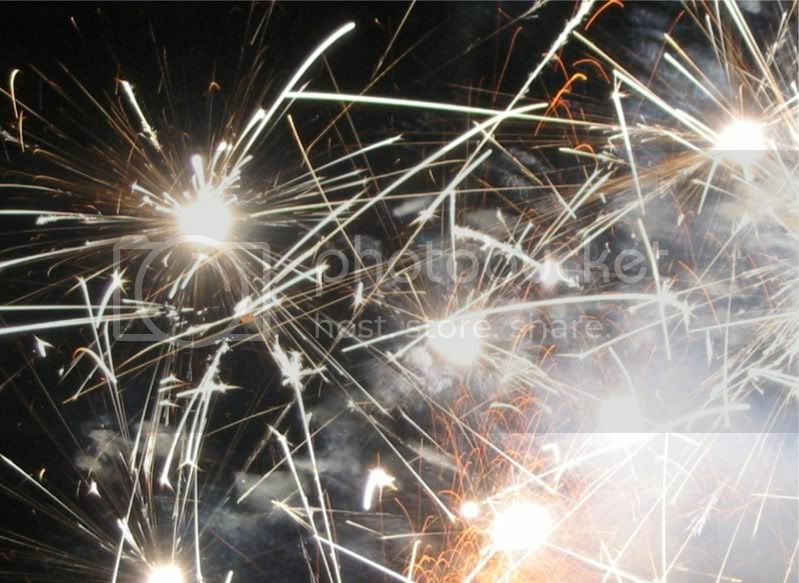 For a long time, we avoided fireworks displays because of our sons' sensitivity to loud noises and crowds. Last year we went to see the one at the mall, but in order to get a good parking spot so we could see we had to show up several hours early. We spent hours in and around the car just waiting around (we walked to a nearby Waffle House for dinner to kill some time) until it got dark. FINALLY, the fireworks display started, but by that time, the boys were cranky and overstimulated. 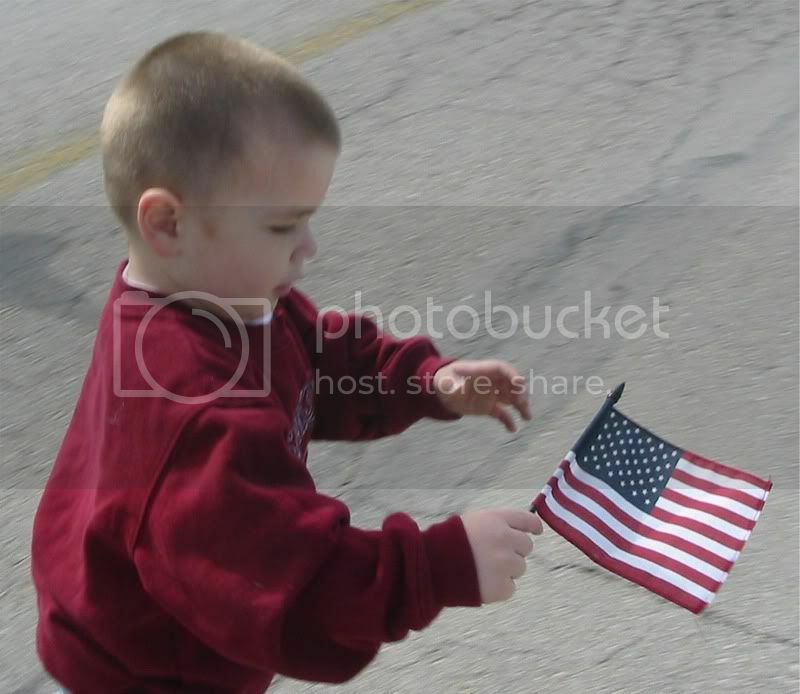 We couldn't even listen to the patriotic music on the radio b/c Little Bitty went ballistic every time we tried to turn off the sound to his Thomas & Friends video. The fireworks only lasted about 20 minutes (all that waiting for 20 minutes?!) and then we had the pleasure of fighting traffic to get out of there which took another hour. So you can see why this year we were willing to fork out some money to buy our own fireworks and avoid that whole fiasco again. Also, we felt like CB and BH, at least, are now old enough to be able to understand to stay away from the fireworks and actually enjoy watching them. They covered their ears sometimes but so did some of the other kids (and adults!) and they lasted through the entire thing before they'd had enough. It was a late night for them but they had fun. As for LB, he was ready for bed at his normal time so I put him to bed and once he was asleep, I set up the baby monitor so I could sit in the yard with the boys and watch the fireworks, while also keeping tabs on LB in case he woke up. I was afraid he'd wake up with all the noise, but he slept through the whole thing. This morning, BH and CB were still talking about what a fun time they had last night watching fireworks :). Since today is America's Independence Day, I wanted to take a moment to say how grateful I am for this country, for the freedoms we have and for those in the military who defend those freedoms, not only for us but who champion those same freedoms on behalf of others around the world. In his book, "Standing for Something: 10 Neglected Virtues that will Heal our Hearts and Homes," Gordon B. Hinckley wrote about America in the introduction section. I'd like to share a part of that section, it has stuck with me ever since I read it, and I think it sums up what is great about America. "I had never thought of this significant perspective before. In no instance during my lifetime -- not in the First World War or the Second, not in the Korean War or Vietnam or the Persian Gulf -- did our nation seize and hold territory for itself as a prize of conquest. To the contrary: On a train from Fukuoka, on the south island of Japan, to Tokyo, I have passed mile upon mile of great, modern steel mills built largely with money from the United States following the devastation of Japan. Now the Japanese are our tremendous competitors in the markets of the world. Not only did we not seize territory at the end of World War II, but we provided the impetus that has led to their superiority in many business enterprises. Surely there is no story like this in all of recorded history! "On another occasion, I accompanied the U.S. Agricultural Attache to the docks of Bombay, in India, and there counted fourteen freighters in the harbor, each waiting to unload its cargo of wheat. We stood there for an hour as ton after ton of wheat from the fields of America was lifted out of the hulls of those ships. That grain spelled life to millions of the hungry of that land. When we returned to the attache's office, he gathered his tabulations from his files and sat down to enter them into a calculating machine. Later, he concluded that the delivery of American wheat to India that year amounted to all of the grain grown in the United States from Colorado westward. Ours is a generous country that has been quick to respond when others are in need." "Mr. Secretary of State, at this conference, among the language that has been used has been a phrase, the difference between hard power and soft power: hard power and military power, and perhaps expressed in America as the only superpower with a grave responsibility to create and help to forward the cause of peace in the world; and then soft power, soft power which binds us all, which has something to do with values, human values and all the things that you and I passionately believe in. . . .
"[W]ould you not agree, as a very significant political figure in the United States, Colin, that America, at the present time, is in danger of relying too much upon the hard power and not enough upon building the trust from which the soft values, which of course all of our family life that actually at the bottom, when the bottom line is reached, is what makes human life valuable?" "The United States believes strongly in what you call soft power, the value of democracy, the value of the free economic system, the value of making sure that each citizen is free and free to pursue their own God-given ambitions and to use the talents that they were given by God. And that is what we say to the rest of the world. . . . There is nothing in American experience or in American political life or in our culture that suggests we want to use hard power. But what we have found over the decades is that unless you do have hard power -- and here I think you're referring to military power -- then sometimes you are faced with situations that you can't deal with. "I mean, it was not soft power that freed Europe. It was hard power. And what followed immediately after hard power? Did the United States ask for dominion over a single nation in Europe? No. Soft power came in the Marshall Plan. Soft power came with American GIs who put their weapons down once the war was over and helped all those nations rebuild. We did the same thing in Japan.So our record of living our values and letting our values be an inspiration to others I think is clear. And I don't think I have anything to be ashamed of or apologize for with respect to what America has done for the world. "We have gone forth from our shores repeatedly over the last 100 years -- and we’ve done this as recently as the last year in Afghanistan -- and put wonderful young men and women at risk, many of whom have lost their lives, and we have asked for nothing except enough ground to bury them in, and otherwise we have returned home to seek our own, you know, to seek our own lives in peace, to live our own lives in peace. But there comes a time when soft power or talking with evil will not work where, unfortunately, hard power is the only thing that works." Obviously America is not perfect. Her people are far from perfect, as are all people. But I believe the ideals this country was founded on are truly inspired, and I am both grateful and proud to be an American. And to quote former President Dwight D. Eisenhower, "There is nothing wrong with America that the faith, love of freedom, intelligence and energy of her citizens cannot cure." And so with that, Happy Birthday America -- Land of the Free & Home of the Brave! Little Bitty does :) This is the scene that greeted me when I came downstairs the other day. 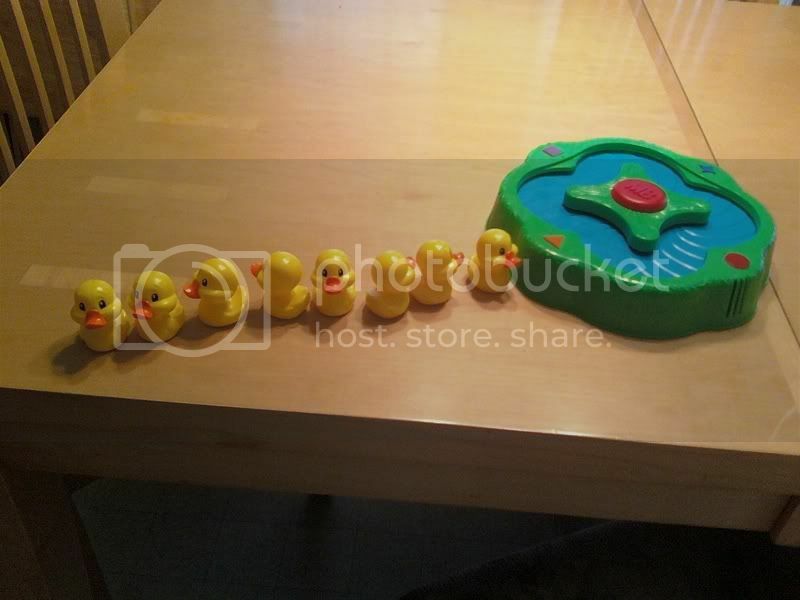 The ducks look like they're all waiting in line for their turn to take a swim in the pond. Later that day, CB told me he'd seen LB running around naked (because he likes to take his pull-ups off) so he went and found a clean pull-up and helped him put it on. He said we were still asleep and he didn't want to disturb us. What a sweetie! I was really impressed, because usually none of our guys have any problem waking us up if we're asleep, no matter how minor the "emergency." I told him I was really proud of him that he helped LB (and us!) by not letting him run around without a pull-up on.